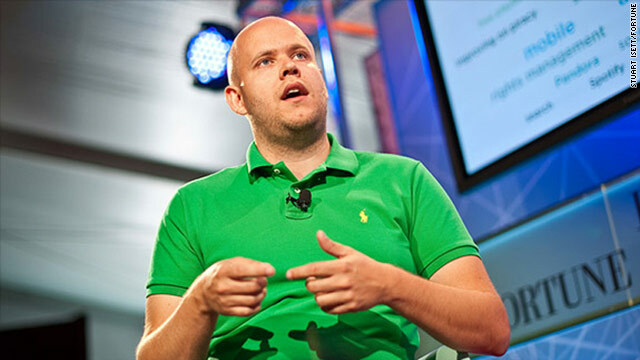 Spotify founder Daniel Ek speaks Thursday at Fortune Brainstorm Tech in Aspen, Colorado. Ek "overwhelmed" at the response since his streaming service launched in the U.S.
Aspen, Colorado (CNN) -- Spotify founder Daniel Ek said Thursday he has been "overwhelmed" by the response to the U.S. debut of his music-streaming service and hopes to attract 50 million users stateside within a year. Spotify has been a hit in Europe for several years but only launched July 14 in the United States. Listeners still need an invitation to join the free service, a limitation Ek says is required to control growth. "We were truly overwhelmed by the response we got when we launched," Ek said during an onstage interview at the Fortune Brainstorm Tech conference here. If Spotify hadn't rolled out slowly in the United States, "our service would have crumbled" under the strain, he said. Spotify, which lets users access songs on demand and store playlists on mobile devices, will gradually extend invites to more listeners as it grows, Ek said. Spotify's computer program lets people choose from any of 15 million songs for free -- up to 10 hours worth of music per month -- with each track listenable up to five times. Users who want to listen more must buy songs individually or pay a monthly fee. Subscribers also can store their music on their devices and listen when they're offline. "What Spotify is saying is, ownership (of music) is great, but access is the future," Ek said. "The main reason people want to pay for Spotify is really portability. People are saying, 'I want to have my music with me.' "
Spotify seeks to help people locate and begin playing a song almost instantly after they think of it. Ek also believes Spotify's social features, which allow users to share songs and playlists via integration with Facebook and Twitter, are key to his service's appeal. "In general, people are comfortable sharing their music," he said. "There are two exceptions, though -- Lady Gaga and Britney Spears." Spotify has 1.6 million paying subscribers, he said. The company has 380 employees and recently opened a New York office. In growing Spotify, Ek has what might be an ambitious goal: He wants to give people instant access to all the recorded music in the world -- not just popular tunes from Western countries. "Our goal is to have all the world's music -- all the African music, all the South American music, all the Asian music," he said. Asked what percentage of the world's recorded music is in Spotify's database, Ek estimated, "probably closer to 80% than 20%." Ek, 28, founded Spotify in his native Sweden in 2006 and launched it to the public two years later. The service gradually grew in popularity and now has more than 10 million users in seven European countries. But negotiations over music-streaming rights in the United States dragged on for years, delaying Spotify's launch in America. The London-based company is entering an increasingly crowded market. Its model is different from Internet "radio stations" like Pandora, which doesn't allow users to order specific songs, and from Apple's iTunes online store, which forces users to pay for individual songs or albums. Amazon operates a cloud-based music-streaming service, and Apple is launching a similar service this fall.